At its heart, a job in information technology is about helping people and solving problems. That’s why at BJU you’ll go beyond learning the current technology and programming languages to learning how to think on your feet as you analyze and solve a variety of difficult problems. In addition to being equipped for a variety of careers, you’ll also learn how patience and humility are essential to the field of information technology and how you can use your field to the glory of God. BJU’s information technology program equips you for more than a job—it equips you for life. Throughout your program, you’ll receive excellent hands-on education in the essentials of technology. You’ll build a strong foundation in server administration, Windows and Linux OS administration and configuration, information security, and network fundamentals. You’ll learn to write traditional GUI applications in C# and Visual Basic/VBA, as well as web-based applications in ASP.NET. In addition, you’ll work in Microsoft Access and SQL Server with database applications. Your courses give you plenty of hands-on learning opportunities in real-life troubleshooting. These problem-solving opportunities give you the skills you’ll need to build solutions for your employers from day one on the job. Because the information technology program combines foundational concepts with practical application, you’ll be equipped for the ever-changing technology industry, and you will develop proficiency with standard industry hardware and software. Our graduates leave prepared to adapt quickly to the ever-changing technology field. The BJU Core complements information technology very well, especially considering professionals in IT work a lot with people. Through the Core, you’ll learn critical skills in communication through courses in English and speech. You’ll take courses in general subjects, such as history, psychology and the arts, so you’ll be able to see the big picture and learn how to build a good rapport with a greater variety of people. In addition, Bible courses will strengthen your knowledge in the Word of God so that its truths influence your life in areas like ethical decision making and integrity in every situation. The information technology program offers you a lot of flexibility with your studies. You’ll have a number of credit hours that you can use to focus on what you want. Many students in the program take additional courses in information technology, computer science or math. Other common electives are courses in business and communication, and some students who plan to work abroad even take extra Bible and language courses. Bob Jones University has provided me a great foundation for my professional career. I learned the fundamentals of code, networking, and enterprise management while getting my degree. The solid base of those skills have helped me grow and succeed in the IT field. Our graduates are employed in a variety of computing jobs, from programming to network administration to computer support. The following is a sample of careers our graduates have pursued. Senior systems engineer at Cisco Systems, Inc.
BJU offers students a variety of ways to network with employers and organizations. A multitude of job opportunities are posted each year on Career Central, our online job board. In addition, more than 60 businesses and 150 Christian schools/mission boards/Christian organizations come on campus to recruit students through on-campus interviews and job/ministry fairs. Career Services also helps students by holding seminars on resume preparation and interview techniques. You’ll have access to multiple well-equipped computer labs around campus. BJU provides both standard industry hardware and software and cutting-edge technology so you will have a firm grasp of the basics and the ability to adapt to an ever-changing field. 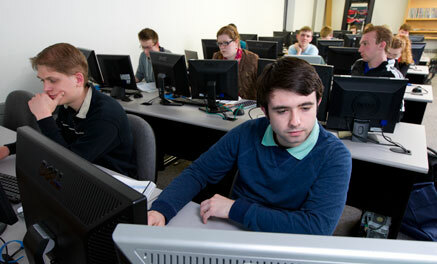 Our upper-level computer science students gain on-the-job experience as lab assistants. You will benefit from their knowledge as you become familiar with the major. Eventually, you’ll have the opportunity to apply for the position and share your experience with others. Employers in the Greenville area recognize the high caliber of our students and often seek them out. Our students have interned at local and out-of-state companies, including Booz Allen, Oak Ridge National Laboratory, Answers in Genesis, Worthwhile, and Follet Software Corp/TetraData. BJU students have the opportunity to compete alongside other Southeastern universities including Georgia Tech, Mercer, Wofford and Emory. 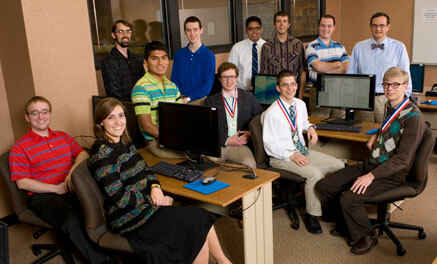 In recent contests, several of the BJU teams have placed in the top five out of 20–30 teams. If you want to network in the field or learn more, our faculty recommend taking part in ACM (Association for Computing Machinery) and ISACA (previously known as the Information Systems Audit and Control Association). These two groups are great places to learn and prepare for your career, in addition to your education at BJU. BJU’s information technology faculty bring extensive experience in both teaching and working in the industry. They’ve spent time in the field as consultants, directors of web development, and software developers. One of our faculty members even holds a patent for the networking capability that our vending machines have. They’ll give you practical advice tailored to your needs and help you prepare for your future. Identify and deploy appropriate technology to solve problems in various domains. Communicate technical information effectively, including business proposals and network documentation. Apply biblical principles of ethics to computing.